Beautiful Voices is our ongoing blog series that highlights inspiring, empowering women. Our most recent Beautiful Voice is Shannon Wintheiser. See what she says when Annmarie asks her some questions about her own personal beauty. Shannon is a certified holistic health coach and yoga instructor, and founder of Radiant by Nature. She is passionate about making holistic health simple, fun, and super-impactful. She invites readers to visit her website and connect with her on Facebook. I have been blessed with so many things in my life and compared to many, I've been fortunate to suffer few great life-changing challenges. But for me, dealing with fibromyalgia (a chronic condition that affects my sleep, energy and how I feel on a day-to-day basis) has been my biggest challenge thus far. I was diagnosed after college, and learning how to manage my symptoms is an ongoing process. I have had to make major sacrifices at different points in the last eight years in my personal life, then in my professional life, to reach and try to maintain a balance that allows me to feel good most days and still enjoy the things I am able to do on a daily basis. In trying to manage my condition, I became passionate about the world of holistic health and nutrition. I was intrigued by the immense changes in my own health I saw as a result of my growing knowledge and experimentations. This lead me to go back to school in a completely different field, quit my job, and start my own health coaching business in the hopes of finding others who could benefit from holistic nutrition and building a healthy lifestyle (which is to say, everyone!—but especially those with certain chronic conditions). So in this respect, I don't know if I will ever completely “overcome” this challenge, since it will always be with me in some capacity, but I have benefited from it immensely as it turned me towards a whole new way of life and well-being. I practice and teach hot yoga on a regular basis, and I feel that I am most at peace in the hot room doing Modo Hot Yoga. Focusing on my breath and body for 75 minutes and sweating like a dog always leaves me with a profound feeling of centeredness, peace, and power. What makes me feel beautiful now is not what it was 10 years ago! That's one of the most surprising things to discover as a woman who turned 30 this year. It used to be that dropping five pounds on a diet made me feel beautiful, or getting brand new makeup or a haircut. Now, I find beauty more often in the different aspects and capabilities of my body. I revel in the feeling of strength and power during a good weights workout, and in the deep breathing and muscle stretching I experience during a hot yoga class. Being seven months pregnant, I have also now discovered a new wonder in the beauty and capability of the female body to expand, accommodate, and support life! Juicing! 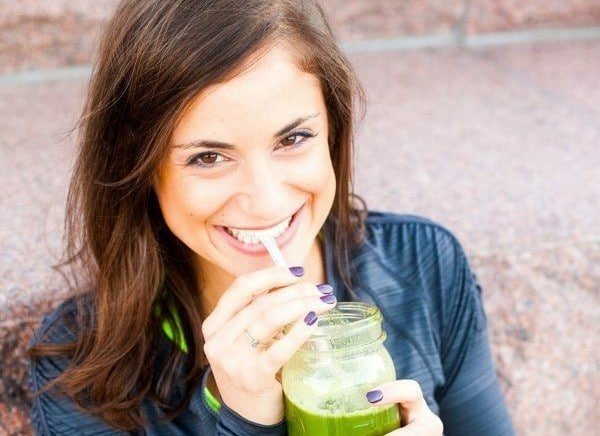 When I started making green juice every morning two years ago, I was shocked at the dramatic improvement in my skin tone, color, and brightness! I recommend green juice to all my clients looking to get more nutrients into their diets, and who want to see glowing skin! I think I'm like most women when it comes to pampering myself—give me a massage, facial, or a week-long beach vacation and I'm a happy camper!